The 112th edition of Il Lombardia NamedSport, organised by RCS Sport/La Gazzetta dello Sport, starts tomorrow morning in Bergamo and finishes in Como in the late afternoon, after 241 gruelling kilometres with 4,000m of total elevation. The official Start List is now available. The final Classic Monument of the season, will be a “revenge” race for the last edition of the Worlds, with the entire Innsbruck-Tirol podium in the entry list. Lining up next to Valverde, Romain Bardet and Michael Woods are the other riders set to challenge last edition’s winner Vincenzo Nibali. Among them are Gianni Moscon, Thibaut Pinot, Adam Yates, Enric Mas, Rigoberto Uran, Tim Wellens, Primoz Roglic, Rui Costa, Wilco Kelderman and Bauke Mollema. Il Lombardia NamedSport will be broadcast in all the five continents. RAI, the race’s host broadcaster, will produce the international feed with three hours live for Il Lombardia NamedSport. In Italy, RAI offers live coverage initially on RAI Sport +HD from 14:00 to 14:50, then on RAI 2. In France it will be broadcast live on La Chaine L’Equipe, while Eurosport will cover the rest of Europe and Asia Pacific. In the rest of the World, Il Lombardia NamedSport will be broadcast on OSN in the Middle East and North Africa, Supersport in South Africa and Kwese Sports in the remainder of Sub-Saharan Africa. In Japan the race will be available on the OTT platform DAZN, and in New Zealand on Sky Sports. In South American and the Caribbean, the race will be broadcast by ESPN, while in Mexico it will be available on TDN. In Canada the race will be shown on the OTT platform Fubo.tv, and in the USA it will be available on Flosports. Il Lombardia will be broadcast live in Switzerland on SRG SSR (on RTS Deux in French and on RSI La2 in Italian) and in Belgium on VTM Medialaan. The total number of territories in which the “Race of the Falling Leaves”, the last Classic Monument of the cycling season, will be aired, is 193. The race sets off from Bergamo, southbound. The route initially leads through the Bergamo plain (over the first 40km), and then up along the Val Cavallina, all the way to Casazza, to tackle the first climb of this race: Colle Gallo (763m). A fast descent leads back from Val Seriana to Bergamo; here the route goes back on flat roads and eventually arrives in Brianza. 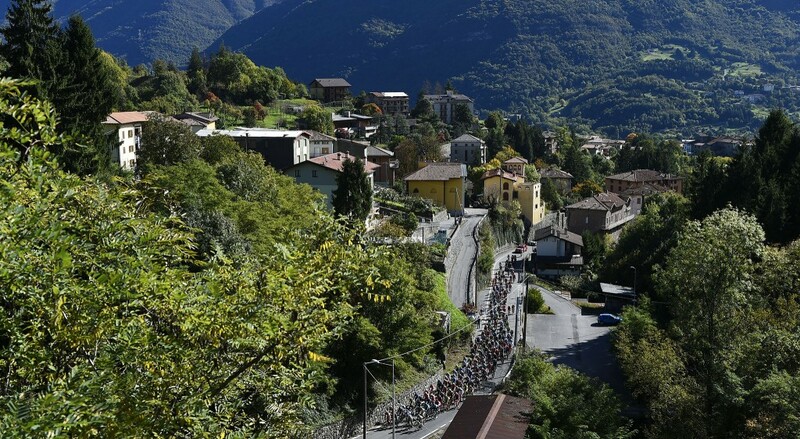 The course passes briefly across Colle Brianza (533m) and descends into Pescate, then heads for Valmadrera and Oggiono. Finally, it rolls past Pusiano and Asso, and then descends into Onno, heading for Bellagio, where the Ghisallo climb (754m) begins. The climb has a maximum 14% gradient, on a wide road, with several hairpins. The descent runs quickly on long, straight stretches up to Maglio, where the Colma di Sormano climb (1,124m) begins abruptly after a right-hand bend. After some kilometres with moderate gradients, a few hundred metres past Sormano, the route turns left to tackle the Muro di Sormano (2km at a 15% gradient). The road is tight and very steep, and it runs partly through the woods, with very narrow hairpins and sharp gradients exceeding 25% and reaching almost 30% after about 1,000 metres. After clearing the Colma, the road climbs down into Nesso (initially a false-flat drag, followed by a very technical descent with several hairpins on narrowed roadway). Here, the route takes the coastal road that leads to Como. A harsh climb up to Civiglio follows (614m), with steady 10% gradients; the route then drops down, runs through Como again, and heads for a last, short climb starting in San Fermo della Battaglia. Two fixed Feed zones are provided: the first in San Sosimo (km 92-95) and the second in Onno (km 163-166). This year as well, during the 112th edition of Il Lombardia NamedSport, Gazzetta dello Sport will pay homage to our dear colleague Pier Luigi Todisco, who died tragically on October 7th 2011 as he was cycling to get to his workplace at the Gazzetta.it newsroom, offering a prize that will be awarded to the first rider clearing the Ghisallo climb (km 180.2), the iconic mountain of Il Lombardia NamedSport, on top of which stand the Sanctuary of the Madonna protecting cyclists, and Fiorenzo Magni’s Cycling Museum. Passionately fond of cycling, Pier Luigi dreamt of climbing the Ghisallo with his bike, and he was actually training to succeed. The prize will be delivered on the podium in Como at the end of the race.